… that Facebook’s engineers would try out their new photo viewer on some different size screens before rolling it out more widely. 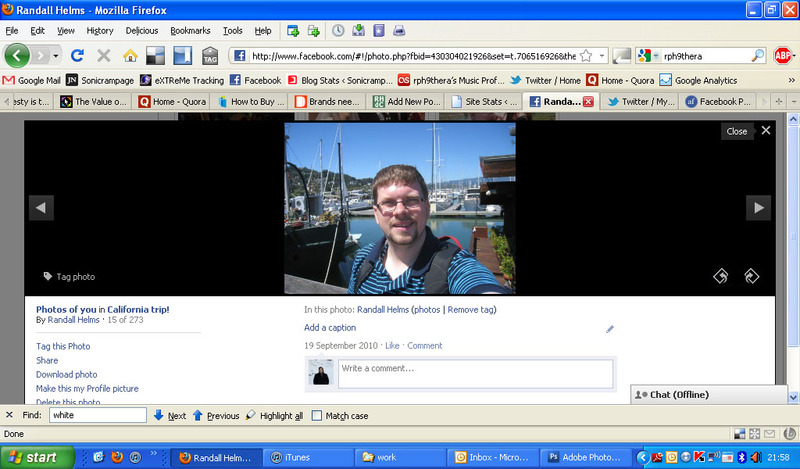 As you can see from the above screenshot from my netbook, this doesn’t seem to have been the case. I’m sure this new popup viewer looks fine on big desktop monitors, but it scrunches images up to show them on lower resolution screens, such as the one on my netbook. It’s hardly the end of the world, but it’s a little annoying, since it reduces the quality of my Facebook experience. I don’t really like peering at tiny photos! Oh well, this change seems set in stone, so for the moment I will have to resign myself to clicking F5 to get back to the old photo viewer, which hopefully they won’t switch off. (If) you’d asked a few years ago what’s the right development platform for Facebook, it would have been easy, we would have said we’ll make a website delivered via HTML, and that would be acceptable to anyone who wants to use Facebook. With all these mobile devices, there’s a huge amount of platform diversity now. When we update the Facebook product we have to update about seven different versions. We have to update the website that runs on your PC, the iPhone app, the Android app, the Blackberry app, the mobile site and a number of other device-specific versions of Facebook. It’s becoming a real engineering challenge for us, as well as other technology companies.